ManageEngine OpManager, the trusted network monitoring software. 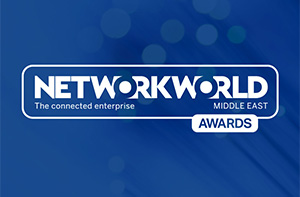 Businesses rely on networks for all operations. Hence, network monitoring is very crucial for any business. 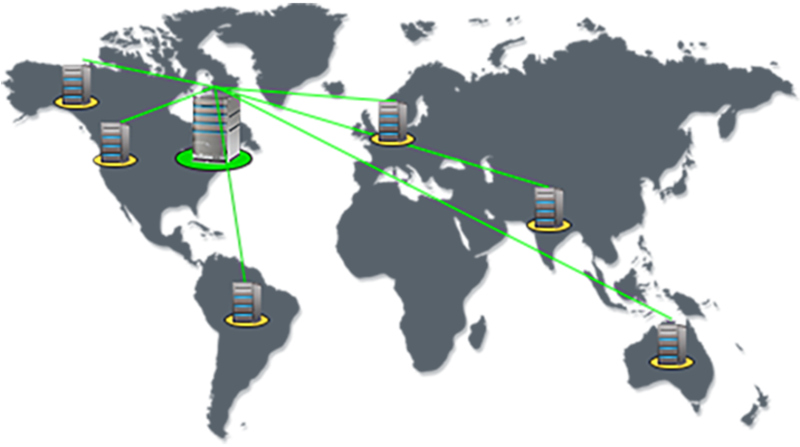 Today, networks span globally, having multiple links established between geographically separated data centers, public and private clouds. This creates multifold challenges in network management. Network admins need to be more proactive and agile in monitoring network performance. However, this is easier said than done. 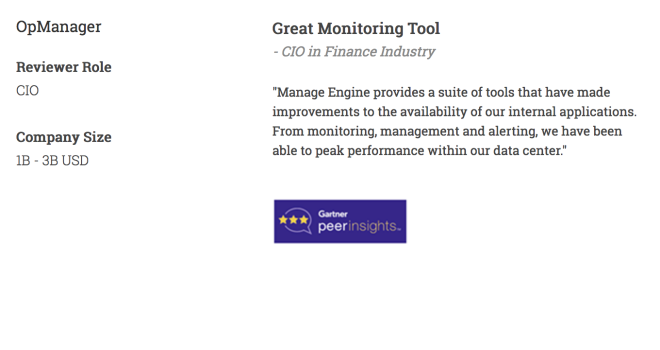 Introducing ManageEngine OpManager, an easy-to-use, and affordable network monitoring solution. It monitors network devices such as routers, switches, firewalls, load balancers, wireless LAN controllers, servers, VMs, printers, storage devices, and everything that has an IP and is connected to the network. 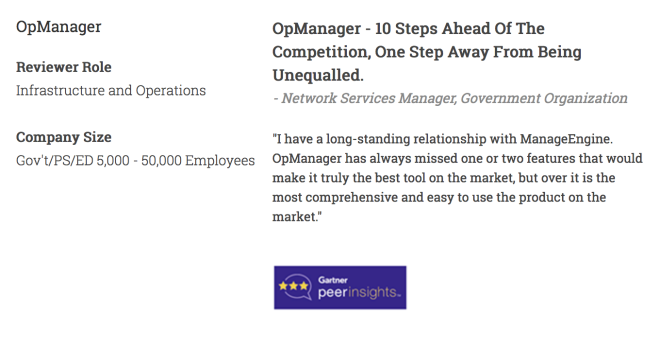 OpManager continuously monitors the network and provides an in-depth visibility and control over it. In case of a fault, you can easily drill down to the root cause and eliminate it before operations are affected. With over 2000 built-in network performance monitors, monitor health and critical metrics such as packet loss, latency, speed, errors and discards, and analyze performance bottlenecks. Monitor CPU, memory, and disk utilization of Windows and Linux servers. Also monitor the performance of Host and VMs of VMware, Hyper-V and Xen virtualization platforms. Proactively monitor network performance with multi-level thresholds. For every critical performance monitor, set multiple thresholds and get instant alerts for violation. Assess default dashboards or create your own dashboards by making use of over 200 performance widgets available and view performance of your network at-a-glance. Monitor key metrics such as latency, jitter, RTT, and packet loss to eliminate network issues. View hop-by-hop performance to find what's causing latency and fix it quickly. ManageEngine OpManager requires no costly consultation or training for installation and user education. 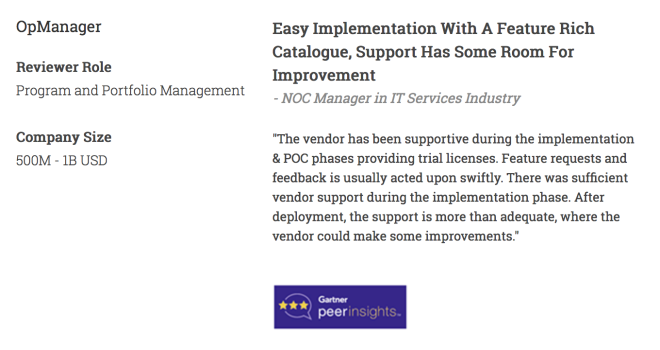 It's the only network monitor tool to offer a transparent device-based pricing model. Most IT shops use multiple network monitoring tools to monitor and manage network operations. However, in case of any fault, they have to sift through multiple tools, GUI, graphs, and reports to go the bottom the issue. ManageEngine OpManager, the integrated network monitoring solution, offers insights into various problematic areas of the network. It allows you to easily drill down to the root cause and fix it quickly. 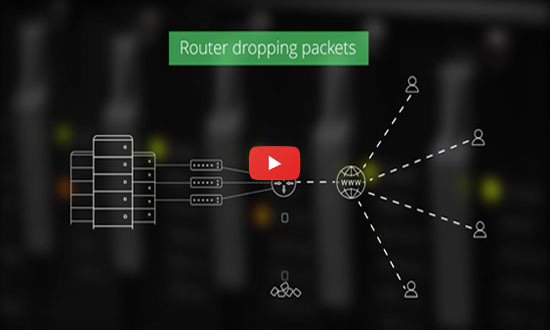 Watch this video to learn how you can easily fix a router packet drop issue with OpManager. End to end network monitoring, simplified. 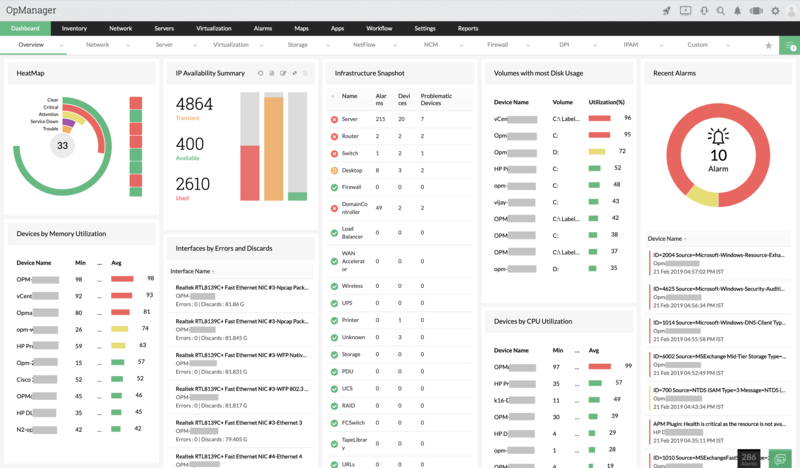 With ManageEngine OpManager, get end-to-end visibility and analytics of network infrastructure including local devices, wireless network, WAN links, non-computing devices like printers and even access points. 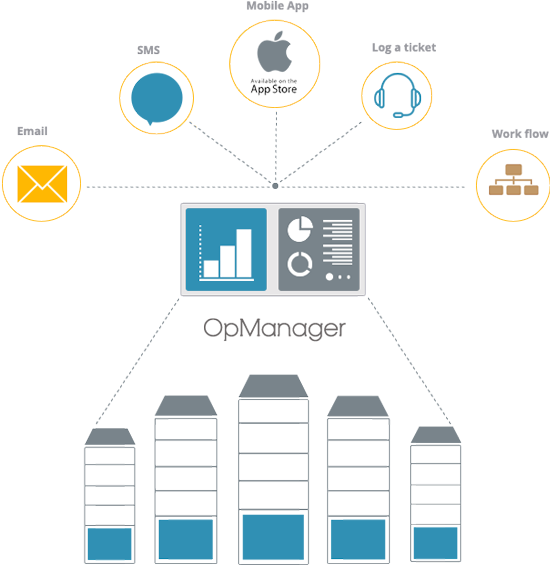 OpManager also provides integrated troubleshooting capabilities with planning and configuration management. View performance, bandwidth consumption, recent device configuration changes on a single snapshot page. Be sure of what’s causing trouble and fix it before it impacts end users. 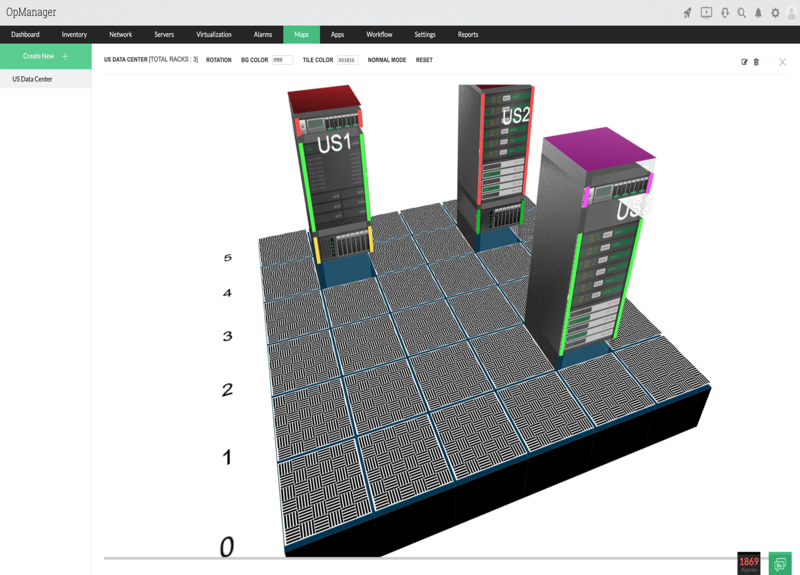 Create racks with populated devices and design data center floors to mimic the data center. Drill down to the actual device snapshot page in case of faults. Create business views with devices and maps of your choice. Visualize device health, traffic flowing between departments or branch offices, application widely accessed on a link, and much more. ManageEngine OpManager lets you be the first one to be notified of faults via email and SMS, which makes you gather more information about it and start troubleshooting before end users ring you. Looking for the right network monitoring tool? Choose an edition that best suits your network and server monitoring requirements. Manage network infrastructure, distributed across geographies from a single location. A sturdy Probe–Central architecture makes it possible to scale up as and when an enterprise grows and expands, without compromising on reliability. Monitor health, availability and performance across all probes through the central server dashboard. 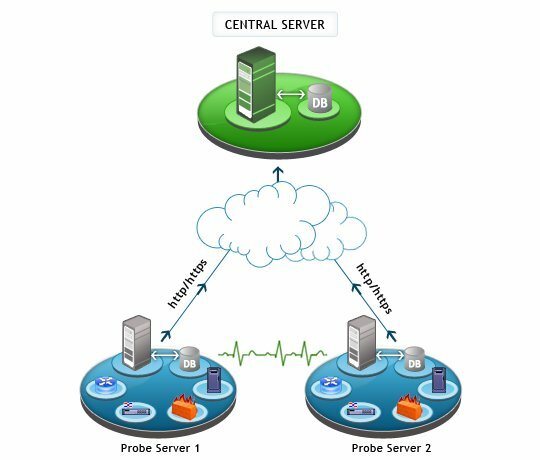 The central server is designed to provide required network visibility across locations, easily scale, consolidate, and report network health over multiple remote probes. Monitor multiple remote sites from a central location with probe specific controls to visualize performance hiccups. View details of devices running on the probe server from a central server's web client. 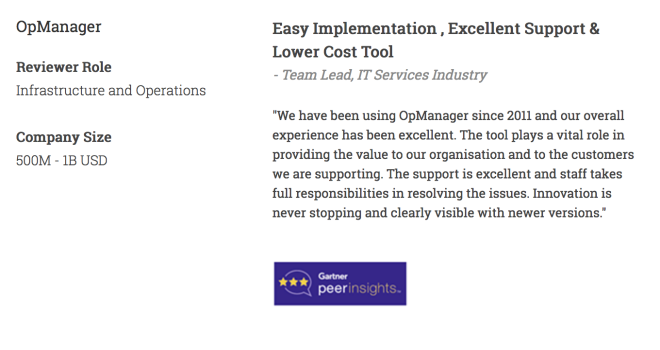 OpManager provides 100% data integrity, even when there is a connection loss between the central and probe servers using local database support. ManageEngine OpManager is the perfect network monitoring system for distributed networks. It's Enterprise Edition is built on a probe-central architecture that lets you monitor network devices and servers distributed across multiple remote sites. Looking for an integrated network monitoring software? 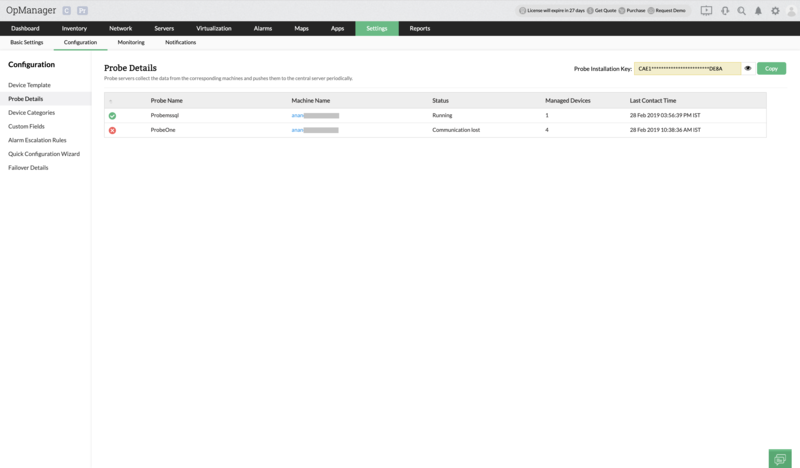 Try ManageEngine OpManager Plus - one tool that offers network monitoring, bandwidth monitoring, configuration management, firewall log management, IP address management, and switch port management. Network monitoring on the go. The majority of network monitoring solutions available today lack an integrated mobile app. 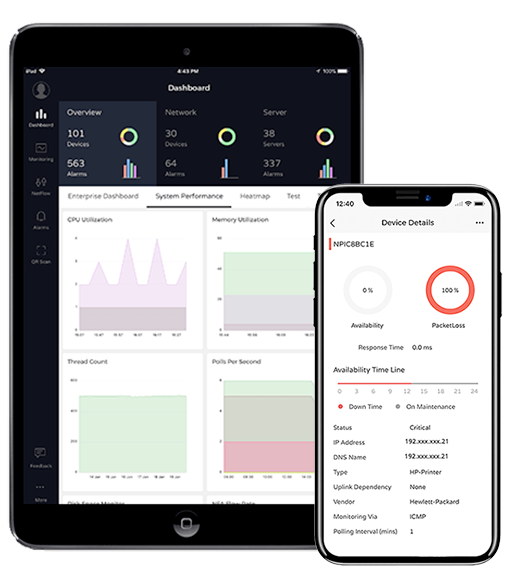 ManageEngine OpManager, the real-time network monitor software offers mobile apps for Android, iPhone and iPad to help you monitor your network, perform basic troubleshooting, receive alarms and stay up-to-date with the availability and performance of your IT devices at the comfort of your home or when you are in commute. 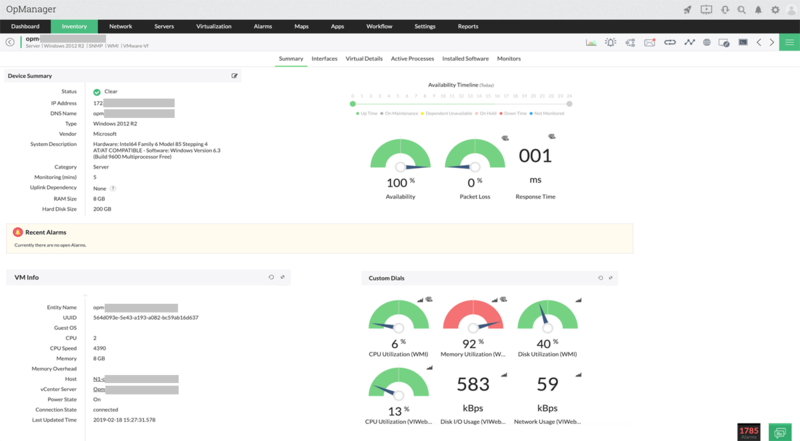 Customize your dashboard for an at-a-glance overview of the current status of your network displaying critical metrics, on the go. Alarms raised by OpManager with severity based categorization. List of devices that are down. Health of complete IT infrastructure. Health of devices in a business map view. What is Network Monitoring all about? Start from the basics. 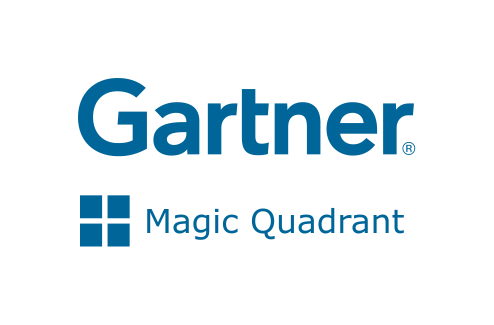 Entered the 2018 Gartner NPMD Magic Quadrant. 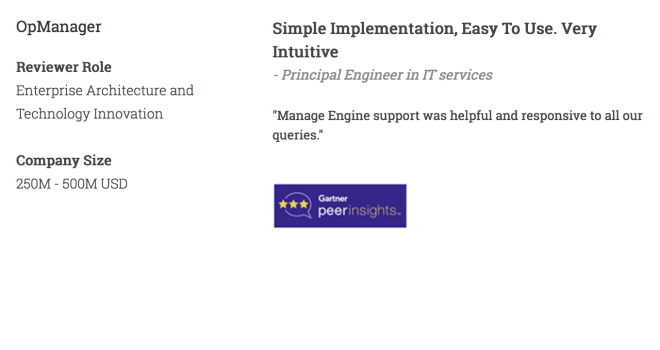 Ranked #2 in the Infotech Research Software Reviews Data Quadrant 2018. ICT Champions Award - 2017.